Arm Span It is the length from fingertips to fingertips of out stretched arms measured at the shoulder height when raised parallel to the ground. 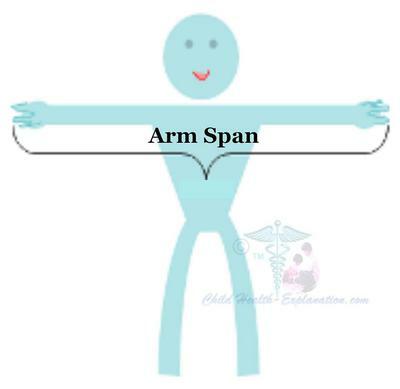 Doc what is the significance of arm-span in growth assessment of children? My daughter is 9½ years old and is of average height but has short arms. Her upper arm measures 24 cm, arm span 126 cm, and her height is 132 cm. Both my husband and I have average or longer than average arms. Is there an assessment that can determine whether this is an abnormality? Data given for the evaluation of disproportional growth retardation is grossly inadequate. Moreover, at 9½ years the child is probably at prepubertal phase, when catch up growth of legs’ length is seen children who have not attained their optimal genetic potential for height. Corresponding increase in the rate of growth of upper segment usually does not occur. This temporarily disturbs upper segment (US) to lower segment (LS) and arm-span to height ratios. In this child US and LS lengths are not known. The height of 132 cm falls at 25th percentile for age, and the arm-span is 6 cm less than the height. This amounts to Arm span/Height Ratio of 0.954. A deficit of 0.045 by considering normal adult value of 1.06 that was first suggested. Arm span varies considerably in different ethnic groups, and from person to person. The range being 1.01–1.04 for mature males and 1.00–1.02 for mature females. Both in boys and girls, leg length to height, leg length to arm span, and arm span to height is directly proportional to the growth rate percentile. This means that in a group of same age children all the above ratios are bigger in those who are tall as compared to those who are short. In the same growth rate percentile group and irrespective of the gender, they are larger in older than the younger children. Together it concludes that the rate of growth of leg length and arm span is higher than that of height in general. Apart from the first two years of life, the most rapid increase in leg length is seen during the growth spurt of adolescence, which coincides with puberty related hormonal effects on the growth plates of the limbs. With onset of puberty, the height gain in children is therefore accelerated. As a result, the arm span normally remains shorter than the height before and during early pubertal changes. It equals or slightly overshoots the height only after puberty during late teenage development, when arms’ growth is faster than the height gain. Therefore, arm span of adults is usually a little larger than their height; about 5 cm in an average man, and about 1 cm in an average woman. 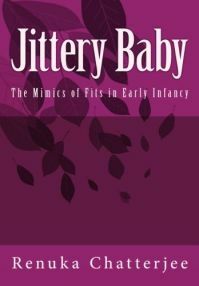 In most infants and toddlers, the growth rate percentile shifts linearly up or down, until they reach their genetically determined growth channel for height percentile. By the age of 3, growth typically proceeds along the same percentile until the onset of puberty. Children and adolescents whose heights and growth velocities deviate from the normal percentiles on standard growth charts need to be evaluated for disproportionate growth abnormalities, skeletal dysplasia, and spinal deformities. Disturbed vertebral growth, as in scoliosis and related conditions, can lead to disproportion in arm span and height. The normal individual variation in growth should not be mistaken for disturbed growth velocity. Parents often compare growth of their child with that of her peers. This creates a wrong impression of growth related problems in children. There are several variations in the growth pattern of a child. For example the growth of leg length is faster in shorter children than in taller children until the onset of puberty, after which growth of leg length in taller children is faster than in shorter children. Serial height and weight measurements over at least 6 months, which are methodically plotted on a growth chart, are the key in identifying individual growth trend. This prevents unnecessary laboratory studies. Nevertheless, children with dysmorphic features need to be evaluated by a geneticist and an endocrinologist.